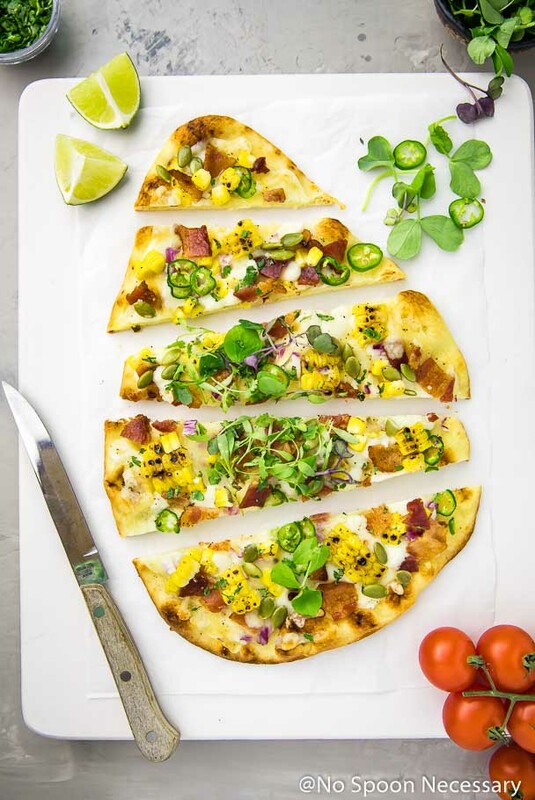 Buttery, fluffy naan bread topped with smoky charred corn, crisp bacon, spicy jalapenos and two types of cheese. 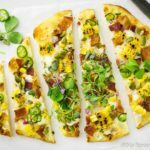 This Tex-Mex Charred Corn, Bacon & Jalapeno Pizza is quick and easy, yet packed with fresh, fabulous flavor! Today we are going to start the weekend celebrations early. Hooray! One – today is Boy and I’s 10 year (dating) anniversary. And, I dunno about you, but a DECADE of love calls for a grand celebration. I’m going to assume reason number one didn’t do much for you, but reason number two! Reason NUMBER TWO totally got you on board for starting the weekend early. AKA fantastically flavorful pizza that will make you wanna hip hip hop and ya don’t stop. 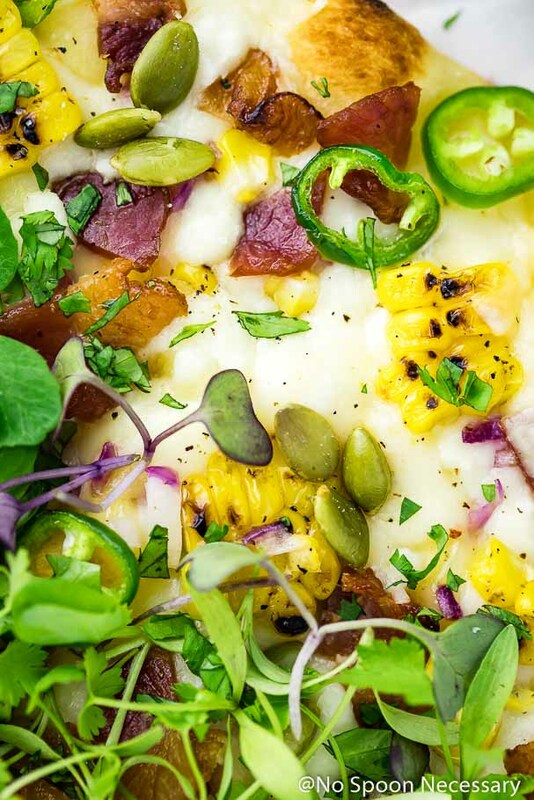 Smoky, charred kernels of sweet corn, pungent red onion, spicy slices of jalapeno, crispy bits of bacon, herbaceous cilantro, ooey-gooey pepper jack, salty cotija and fresh, peppery micro greens. Basically, this pizza is like a ginormous dance party for your taste buds. It’s got cheese for days. I mean real talk, what more could you ask for?! While I used naan bread for my pizza, because it is too easy and delicious not to, you could absolutely use any kind of pizza dough you would like. 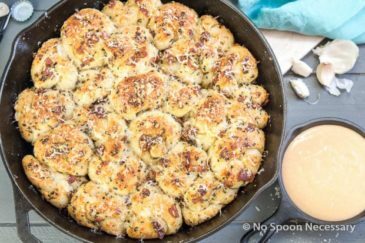 If you are making your own dough, or using a store bought ball of pizza dough, the recipe below will yield one large pizza instead of 2 naan (individual sized) pizzas. 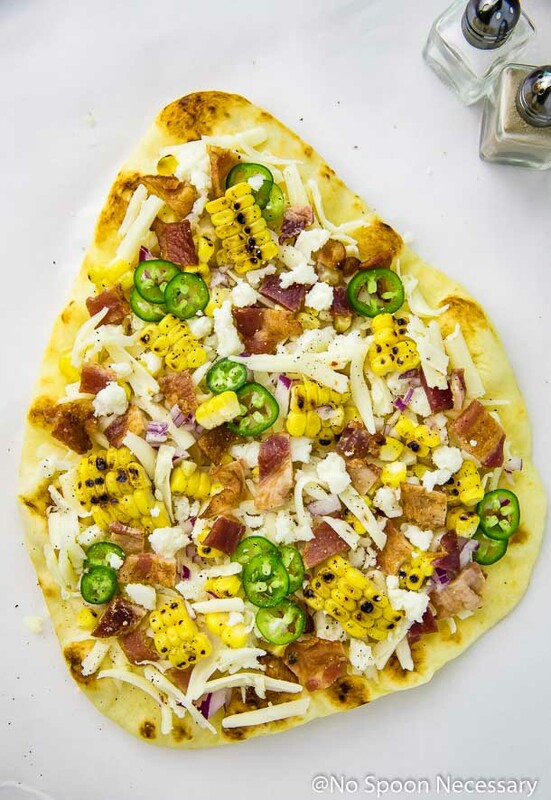 I grilled my corn for this pizza, and just in case you are new to grilling, I’ve included instructions on how I grill corn in the notes section of the recipe below. Conversely, you can prepare your corn on the cob however you would like, or you can use frozen (defrosted) or canned corn. If you don’t want your pizza to be spicy, make sure you remove the seeds and ribs from the jalapenos before adding them to your pizza. 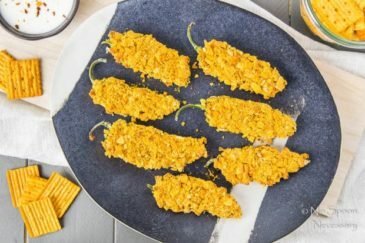 All of the spiciness of a jalapeno lives in the seeds and ribs, so you can control the spiciness by removing all, some, or none of them. Cotija is a Mexican cheese and can be found at most grocery stores in the specialty cheese section. If you can’t find it, feta is a good substitution! 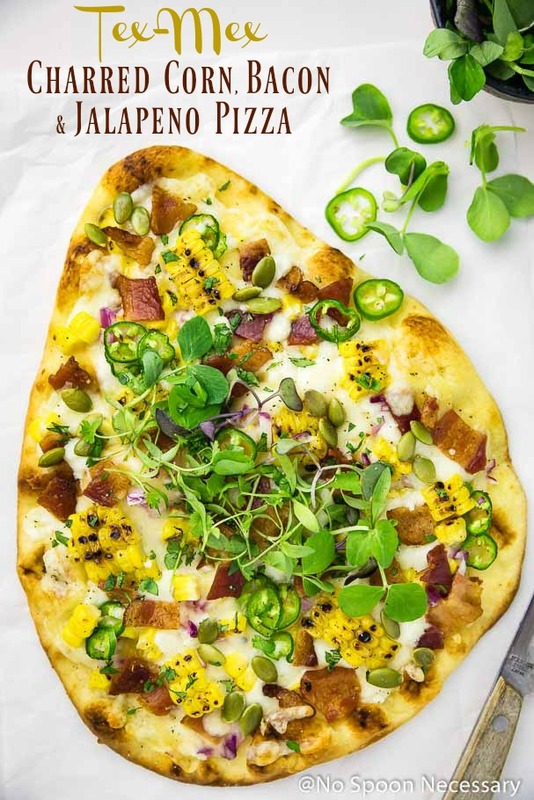 I used Mexican Fiesta Microgreens on my pizza, but any variety of microgreens will do. If microgreens aren’t your thing or you can’t find them, arugula would be equally as delicious! While I didn’t add it to the pizza you see photographed here, I highly recommend you add slices of avocado to your pizza! 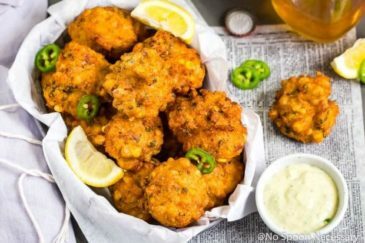 The rich creaminess adds a wonderful texture and flavor. Just make sure you add the avocado AFTER the pizza has done baking. 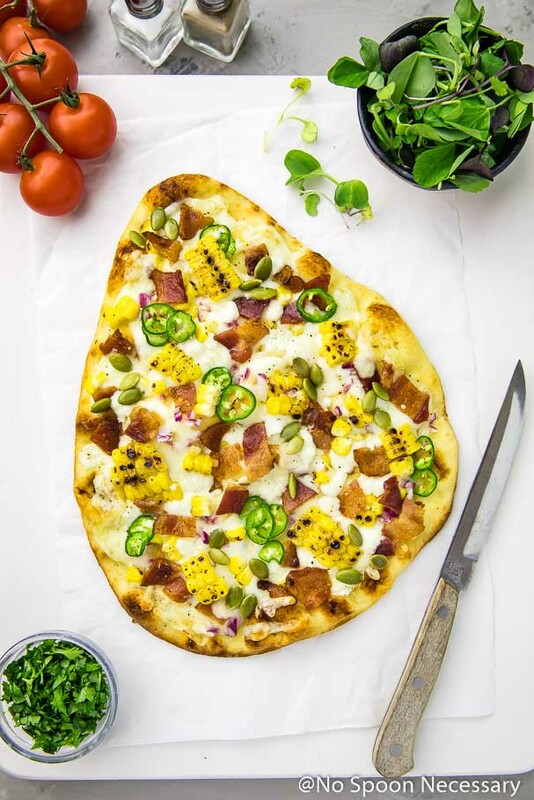 Enough chit chat, make this Tex-Mex Charred Corn, Jalapeno & Bacon Pizza and get your weekend started off with a bang (bang boogie). Preheat oven to 400 degrees F. Line a baking sheet with aluminum foil and spray with nonstick cooking spray for easy cleanup. Place naan on prepared baking sheet and drizzle evenly with olive oil. Top the naan with half of the pepper jack cheese and half of the cojita. Scatter the bacon, jalapeno, corn and red onions on top. Add the remaining pepper jack and cojita. Season generously with salt and pepper. Bake 7-10 minutes or until golden brown and cheese is melted. Remove from oven and top with microgreens, cilantro and optional toppings if using. Squeeze fresh lime juice over the top, slice and serve. Enjoy! 1. While I used naan bread for my pizza, you can use any kind of pizza dough you would like. If you are making your own dough, or using a store bought ball of pizza dough, the recipe below will yield one large pizza instead of 2 naan (individual sized) pizzas. 2. I grilled my corn for this pizza, but you can prepare your corn on the cob however you would like. 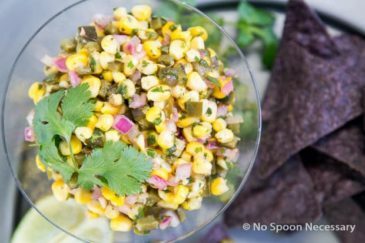 Or, you can use frozen (defrosted) corn or canned corn. Brush the corn all over with oil and generously season with salt and pepper. Grill, rotating every 2-3 minutes, until corn is charred all over, about 10-12 minutes total. Remove to a clean work surface. Set aside until cool enough to handle and then cut kernels of corn off of cob. Add diced bacon and cook until fat is rendered and bacon is crispy. Remove with a slotted spoon to a paper towel lined plate to drain. 3. If you don’t want your pizza to be spicy, make sure you remove the seeds and ribs from the jalapenos before adding them to your pizza. All of the spiciness of a jalapeno lives in the seeds and ribs, so you can control the spiciness by removing all, some, or none of them. 4. Cotija is a Mexican cheese and can be found at most grocery stores in the specialty cheese section. If you can’t find it, feta is a good substitution! 5. I used Mexican Micro Greens on my pizza, but any microgreens will do. If microgreens aren’t your thing or you can’t find them, arugula would be equally as delicious! Ten years of love definitely warrants a celebration — congratulations and I hope you enjoyed your day! 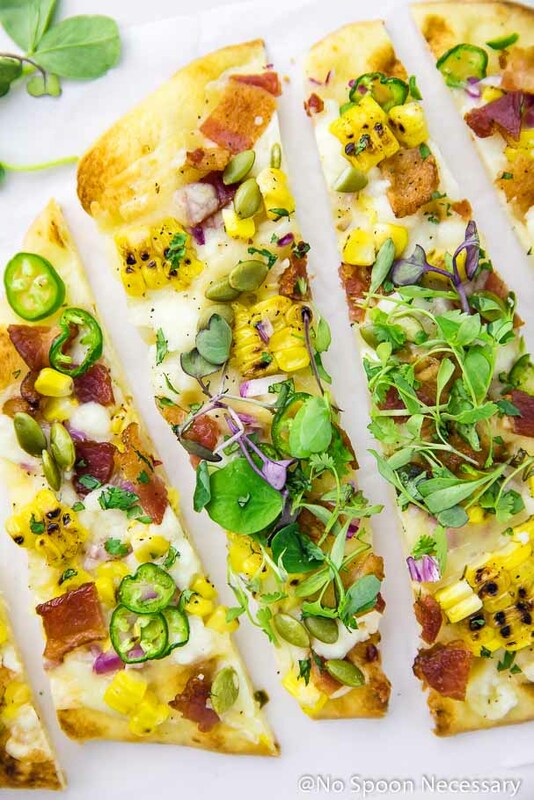 This flatbread is so up my alley with all that charred corn and jalapeno…and BACON! 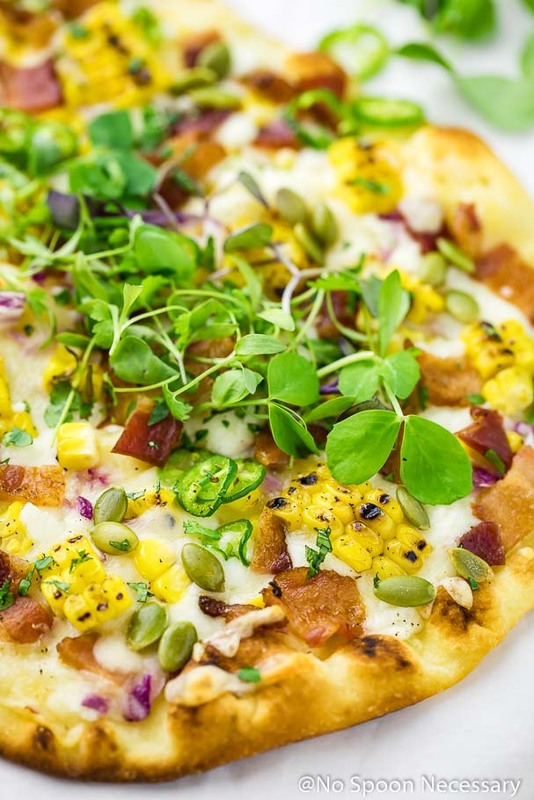 Love this summery flatbread Cheyanne! I love all the flavor that is going on this pizza. The naan is a great choice for the crust of this pizza. I would love to have this for pizza night!